Alone, Away, And Hungry was my status one afternoon when I was wandering into the offbeat villages and hills of the Sahyadri Range. 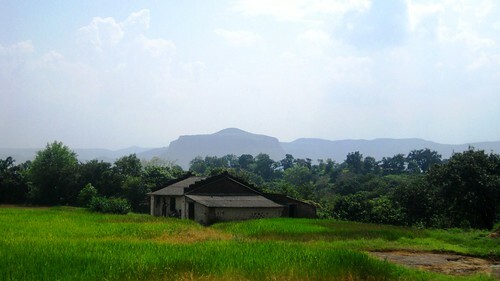 Since morning that day, mountains, curvy ghat roads, waterfalls, cattle and fields had been my points of contact. I had started the day stuffing myself with multiple plates of Poha and Chai garam. 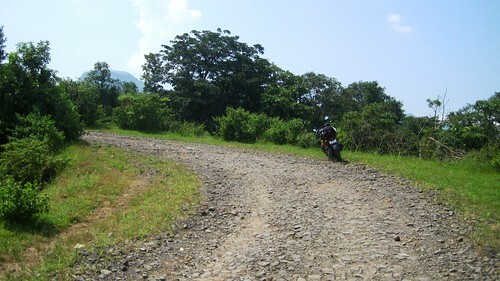 After that I headed for Malshej Ghat, Pargaon, and Ghatghar and that morning meal seemed like something I had ages back! In that state, I was going towards Naneghat when I stopped for a photo break and saw 3 little girls hanging out at the village bus stand. They started laughing at me and my riding gears and camera when I stopped at the intersection for a few clicks. For some fun, I raced the bike towards them, and they started running. I decided to follow them for a while and see where they stop; everyone was having fun. They stopped at a hut and hid behind the tree and haystacks. I parked the bike and continued the Run and Tag game for a while, when an uncle from the hut appeared. He introduced himself as the father of the girls and I reciprocated as a passing by traveler. We started having some chat about my travel and I decided to cash in on the situation. I: So, you guys had lunch and all? I (disappointed): Oh, okay. Umm, is there anything left? I (further disappointed): Hmm. Umm, when will be the time for the next meal, haha? He: In the evening, dinner time. I (can’t look anymore disappointed yet tried): Okay. By that time I guess, the gentleman had guessed that I was hungry. Of course, I had made it obvious. I: Well, yeah. Couldn’t find a restaurant anywhere. He: Yeah, no eateries here. Should we cook something for you? I (shamelessly, spontaneously): Ohh yes, that will be great! So, I relaxed below the tree in front of their hut (on a mat he spread for me) and enjoyed the mountain breeze while their kids, goats, chicken and grandpa alike played around my bike with the biking gear. He asked about my travels and I asked about their life in this remote village. He said the life was simple, starts with the sound of the rooster and ends with the dying Sun. Community gatherings where they celebrate festivals together are the good times. Everybody knows everybody. In the meantime, smoke had started rising from the chimney and the air was filled with aroma of the spices making the giant rats inside my stomach even more relentless. Finally the call came from inside. 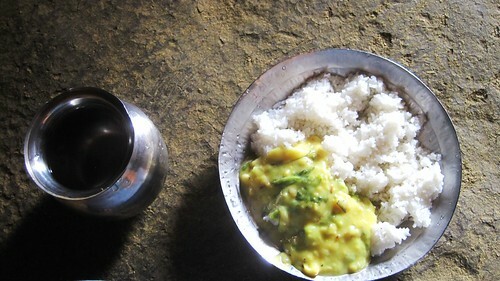 And I calmly excitedly got up and walked into their hut and had my fill of freshly cooked Rice and Besan ke Gatte. All the manners were forgotten while I gorged on the best meal in the best ambiance and with best company. After having the food, I was given a walk around the hut, their royal abode. 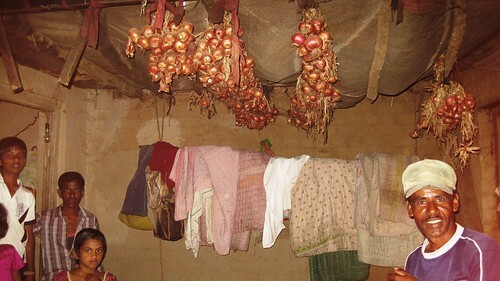 By the way, did you know hanging the onions from the rooftop can prevent them from getting rotten for months? Overwhelmed with sorrow to the point of Hospitality! I wonder; how Urban people treat a rural poor who comes to Urban area! I’ve seen people laughing at their dress and body language when they appear in cities! Here, I can also differentiate between “loving Humanity/Human” vs “loving Machines/Money”! I agree to the below comment…great hospitality by them… 🙂 Naive people, simple gestures…. Thanks Surya, it was a beautiful trip! I’m glad to read you Jatin, and more importantly I’m happy to discover you are on the road and you are enjoying it..
Keep going here and there, maybe someday you won’t go back Hyderabad and our path might cross again. I’m hopeful our roads might meet again sometime. Keep traveling! 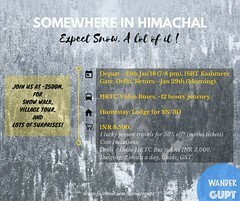 Great Post Jatin….these people still believe in Atithi Devo Bhaba, which most of us has forgotten…I wonder if we would have done the same for a hungry villager visiting our city…such warm and hospitable people. Dats wonderful Jatin. You know there are good, well-meaning people all around, we just need to trust our instincts, trust the fellow human beings and give them a chance. I hope it is as easy and heart-warming for female solo riders. Wish u luck! ohh I love this post. I can so much relate to it and always love the simplicity. Thanks man. Yeah the love and simplicity are always welcome, right?! This is great! 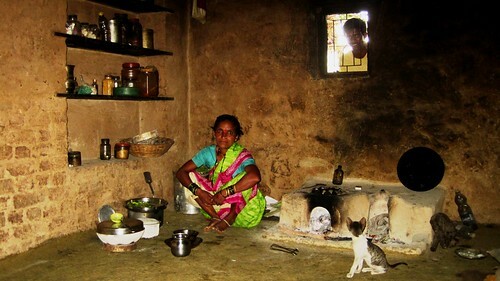 I love such encounters and had done something similar to this in a Chettinad household in Karaikudi. I must post on it soon. Hey Mr Cool! That was a super duper story. Very Earthy. Loved reading. Thats rice and jhunka! What a meal! The food looks indeed yummm!